Aaand, Instagram never brought me traffic! I thought Instagram was just a waste of time because no one was looking to learn anything but only to have fun. Later did I understood that Instagram is not a promotional media, it’s a social media and you need to create relations first, and then promotions! Hence, I started providing 80% educational and quality information on my account and just 20% of them as my blog post promotions. Now, I am gaining maximum of my website traffic from Instagram and that’s all because I have implemented ways to build relationships with my followers – one of which is using pre-thought captions. Champion Advice: Never write your captions as an after thought for posting anything on Instagram. Take time to build your captions to make it enticing and engaging. Make sure that your captions are interesting and have a CTA to make people stop, read and comment on your post. With the new algorithm, engagement wins the race… The more engagement you have on your post, the more Instagram shows your posts to other people on their feed. 1. Me drinking the best coffee from CCD. People will like your photo if it is actually great, but comments? Nope. Your caption doesn’t give that encouragement to comment! 2. Everyone deserves a nice, hot cup of coffee to warm their souls. My go-to all hot beverage is a hot coffee from CCD. Getting a whiff of hot steam coming from the cup always clears my senses. Have you got a favorite drink to cozy up this time of the year? Isn’t this enticing? This caption gives a sense of personal touch + you get to know the person. And you can RELATE to them. Show them what are you. What makes up you and your brand? People want to follow people and not a robot. They want to know you and build connection. They will do business with you if they know you on a deeper level. Look at this caption, this lady from @lifefullofvegetables has just started her account, but knows how to caption really well. She has added personal touch, whilst telling everyone the “why” of her account. That’s brilliant! People should feel related to you when they read your captions, they should feel a part of your community. So instead of just putting out “happy weekend” try adding some sort of feelings or emotions. See how it makes a huge difference? Such captions make people relate to you and entices them to actually engage with your content. Start adding some emotions and feelings to your captions. This one thing can make your post unique from the competition among your niche. Instead of just telling what’s in the picture, consider telling a story behind it. People want to do business with people they know. Don’t be someone who is just doing business. Create a relationship with your audience. Tell them stories behind the picture. Let people know you at a deeper level. Have a look at this caption, @happygreylucky uses this element really well. She knows how to tell a story behind the scenes that engages readers. So you followed all the points mentioned above in your captions. You wrote a story that made everyone relate to you. But you didn’t add a call-to-action (CTA). Your audience will start scrolling without engaging with your content. Don’t keep them hanging there. Add a call-to-action (CTA) to compel them to take some action after they read your caption. For instance, you can write, “Comment down *insert_emoji* if you agree”, or “Am I the only one feeling this, or is there anyone else who feels the same way?”. Such CTAs will drive engagement to your post. Want them to visit your website? Tell them why. Want them to use your hashtag? Ask it. Remember, if you don’t ask for it, no one’s gonna do that on their own. Fill in the blanks type questions like “My favorite character from FRIENDS is _________”. Now, I already have a post on which type of questions have proven to gather more engagement. Here is the post if you wanna check that out. I know that captions can be tough. Especially if you’re not good at sharing personal feelings, like me ;). Grab these free captions and use them in your posts to increase engagement. Can you use COPY & PASTE Captions? 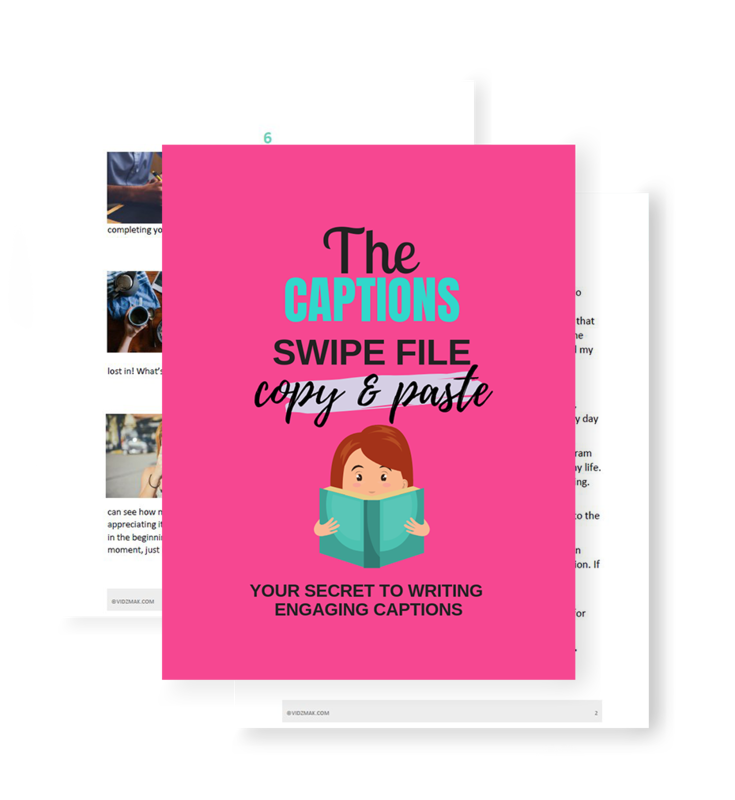 Download my already written captions to increase engagement on your posts!